How many times have you heard that? I’d rather think of it as a good tradesman always uses the best tools, or at least looks after his tools. Reading the title of this post you’d be excused for thinking it’s about DIY when in fact it’s about golf. A few years ago I was proud of the fact that I’d played with the same set of clubs for 10 or so years before I met someone who taught me otherwise. Technology advances in golf have been massive over the past few years and I benefitted from upgrading my trusty old clubs to a set that helped rather than hindered my game. If you can afford it I’d also recommend you get some custom fitted. That way when you play a bad shot then you know it’s the tradesman and not the tools. However that said, the basic science of golf club design is the same as it’s always been, i.e. the more loft you have on the club, the higher it flies, and the longer the club the further it goes. So why am I stating the obvious, well only recently I discovered that one of the most important, if not the most important, clubs in my bag… the putter, wasn’t working correctly and it was a problem with the tool rather than the tradesman (albeit it might have been the tradesman as well but please humour me). Since buying a new putter (Odyessy #7) a few months back I found that it was great from about 10 feet in, but anything longer was inconsistent in that sometimes it would leave the ball way short whilst other times it would fly the ball past the hole, and yet I felt like I was making the same stroke. The other thing I found was that it didn’t work at all from just off the green (the so called Texas wedge). 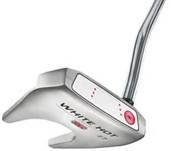 Anyway, I thought to myself it’s time for a new putter but before I went to buy one I browsed the web and came across this article on the science of putters and in particular how loft works on putters. I discovered that my putter had a -1 degree loft whereas the textbook loft should be +4 degrees. So earlier today I popped into my local pro shop and they adjusted the loft for me. Having spent an hour or so on the practice green tonight I have to say it feels like a different putter. Long puts are more consistent and out of the fringe around the green it is much more consistent. And the moral of the story is, sometimes it’s okay to blame the tools… but if you do then make sure you get them checked out. Previous postHow difficult should it be to buy a car?